Ground source heat pumps take heat from the ground, raise its temperature and use the energy to heat your property. 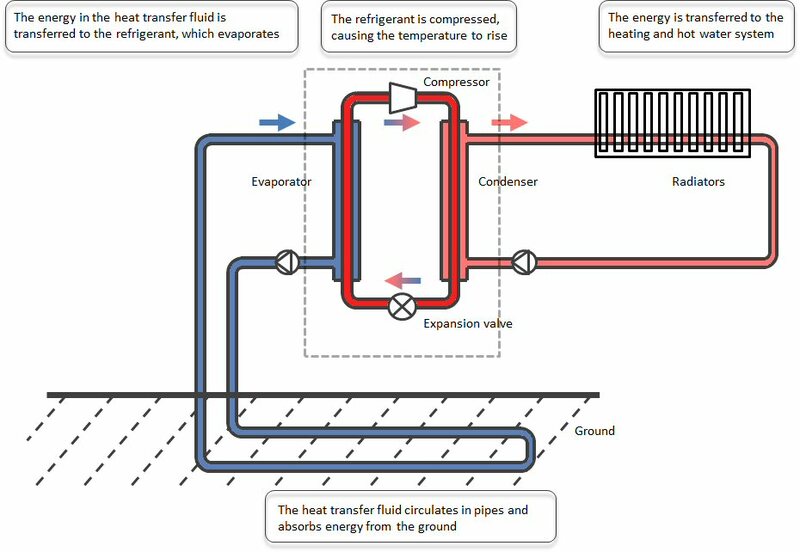 Ground source heat pumps operate on the same refrigeration cycle principles as a domestic fridge, but use the cycle in reverse to generate spatial heating and domestic hot water. The pumps can also be used to provide spatial cooling either using a passive circuit to meet low level cooling demands or using an active circuit where cooling demands are higher. 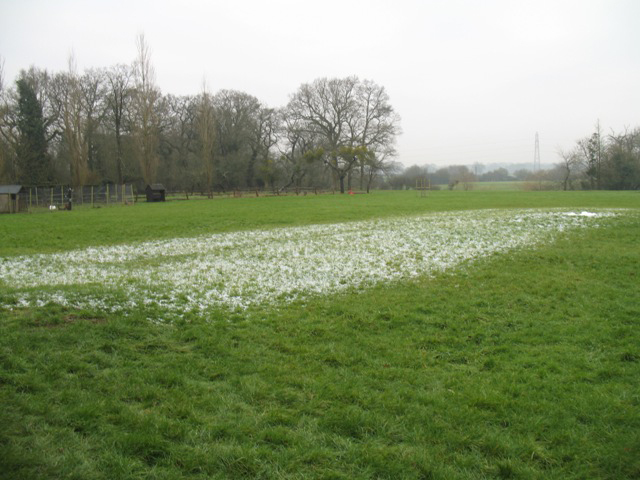 Both active and passive modes can act to partially replenish the ground array and, if both heating and cooling modes are utilised, the total annualised seasonal performance factors can be very high. This can deliver excellent fuel savings and significant carbon emissions reductions. The advantage of using a ground source heat pump is its efficiency. For every kWh of electricity used to power the heat pump, about three or four kWh of energy is extracted from the ground. This ratio of heat supplied to the building and the electrical energy consumed is called the Coefficient of Performance (CoP). In the simplest form, think of it as buy one get three free! Installation will typically consist of a heat pump, ground collector array to absorb energy from the ground, a manifold and manifold pit for joining it all together, circulation pumps to move the energy around the system, various automatic and manual valves, an expansion vessel, a buffer tank to store the energy, a hot water cylinder for heating domestic hot water and a weather compensated control system to make it all work. Ground Source Heat Pumps take solar energy stored in the ground and compress it to heat your property and/or provide hot water. Heat absorption is achieved by circulating water mixed with antifreeze (Glycol) through a closed collector pipework system. The temperature of the earth at one metre below ground level remains fairly consistent between approximately 6 - 12ºC throughout the year depending on geographical location and soil type. Contrary to popular belief this is stored solar energy, energy from rainfall and (in some circumstances) energy from migrating ground water, not geothermal heat from the centre of the earth. 1. Energy in the form of heat is absorbed from the heat source (rock, ground or lake) through a closed collector system containing water mixed with vegetable based antifreeze. 2. The collector fluid then transfers this energy to the refrigerant in the heat pump's evaporator heat exchanger. 3. 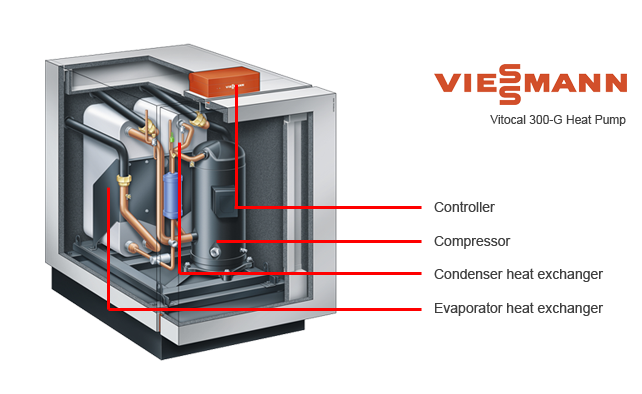 The refrigerant vaporises and is then compressed in the compressor which is where most of the electricity is consumed. When a gas is compressed its temperature increases to around 50°C (this is the core scientific principle behind the gas compression cycle). 4. The refrigerant, with its increased temperature, enters the condenser heat exchanger where it transfers its energy to the heat medium circuit. This then provides spatial heating to the wet radiator or underfloor heating circuits, the hot water cylinder or a combination of heat emitters. Using a lake or river as the heat source is the most efficient option, as water has excellent heat transfer qualities and its temperature is regularly refreshed as the cold water is replaced by warm water allowing for more heat to be extracted. Installing the collector in a lake or any permanent water source will normally reduce the necessary collector pipe length. Theoretically, it is possible to install an open loop collector in a river or lake that circulates the actual river water through the heat pump. However, isoenergy strongly recommends avoiding open loop collectors as they are prone to getting blocked by the river’s occupants, fish, algae, plant matter etc. If a water source or sufficient space for ground loops is not available, drilling boreholes becomes an option. A series of boreholes take the collector pipe straight down into the ground rather than horizontally. This takes up a much smaller surface area. In the UK, drilling can be an expensive exercise due to the complex geology across much of the country. isoenergy can recommend trusted and competent drilling contractors to ensure you receive the most affordable drilling solution. Some installers may suggest using high density coils of collector pipe called slinkies. Whilst this form of collector can be deployed in appropriate ground conditions, isoenergy strongly recommends that the soil conditions must be fully understood before selecting this technology. The use of slinkies can result in the same total length of collector pipework being installed in a significantly smaller area of land. In this instance, the thermal extraction rate per square meter will be higher. If this isn’t taken into account during the design phase, the ground recovery rate could be lower than the extraction rate required to support the building load. In the worst cases this can result in permafrost (see below). A heat pump can generally reduce energy bills by between 40-80% when compared to oil or LPG alternatives. When run efficiently at about 45ºC, heat pumps can produce around four times as much energy as they use. This ratio is called Coefficient of Performance (COP) and means that for each kilowatt hour of energy provided to the heat pump, four kilowatt hours of energy will be provided to your house. The key to an efficient heat pump installation is ensuring the system produces adequate heat for the required application. So the first step in the installation is to measure your heat requirement as part of a site survey. Isoenergy will visit your site and conduct a visual survey to establish an estimated heat requirement for the purposes of providing an estimate. A more detailed site survey is carried out once the project commences to verify the system specification. Do you have running water on your site? If not, is there ample space for a ground loop array or would you need to sink boreholes to extract heat from the ground? In period and listed properties, insulation levels are frequently low. This means that at very low external temperatures, the radiators may need to run at temperatures higher than those which result in optimised heat pump efficiency. This does not mean that a heat pump cannot deliver excellent results in terms of heating and savings against fossil fuels if the system design takes all these factors into account. 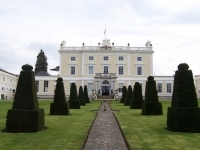 isoenergy has extensive experience of installing ground source heat pump systems in all types of buildings, and has unparalleled understanding and know-how in designing and installing solutions in all property types ranging from cottages to country houses and listed buildings of all periods and sizes. Will a heat pump alone provide enough energy for your requirements? In some circumstances, it may be appropriate to integrate a heat pump with a fossil fuel boiler in what is called a bivalent configuration. This is one way of accommodating higher flow temperature requirements for short periods in winter when the ambient temperature is very low for prolonged periods of time.